Little Painted Nails: River Rafting and Fly Fishing and Whatever Cleaning I Have to Do. River Rafting and Fly Fishing and Whatever Cleaning I Have to Do. Okay, so the girls had their grandparents take them away for the week. 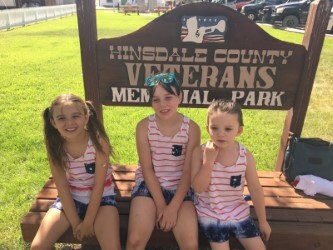 At first, I was a little apprehensive as they will be missing our Fourth of July traditions, including having our neighbors over for BBQ and setting off COMPLETELY LEGAL fireworks in the back yard and sitting on the second hole of City Park Golf Course for the city’s annual firework display. My wife and I finally acquiesced to the request and sent the girls off to Gunnison, Colorado. While I was reluctant at first, I have to admit that I did loosen to the idea as evidenced by the fact that within twenty minutes of the little one’s departure, my wife and I were enjoying a beer at a brewery down the street from our house. It was nice to sit and talk to another grown-up without the seven question a minute pace my children generally set. We sat and discussed, well, the kids. We talked about that week’s soccer games and Avery scoring a goal and making a fantastic save, we talked about Macy playing well but being inconsolable after a rather meaningless loss and Darby deciding that she wanted to take a summer off of the sport. In order, we decided that we were thrilled for Avery, needed to have a chat with Macy and that despite it not being great for her, Darby taking the summer off was great for us. After that we went home and began to straighten up after the debacle that was getting the girls out of the house. The only other event that came up so far was a reading we attended for a friend who just published his first novel. That’s it. That’s the fun that we gave ourselves. I guess in the spirit of transparency, that’s the fun we afforded ourselves that didn’t involve running around Horsetooth Lake trying to get ready for our Wild West Relay. Beyond that we have planned a fun filled week of cleaning the house, thinning the girls over abundant clothing supply, putting our garage back into order, a little gardening, mowing the lawn, prepping for a new diet and if that fun wasn’t quite enough, I am also taking online classes that have taken over my life. As my wife put it, “What would the ‘us’ of fifteen years ago think about the ‘us’ today?”. Chris and Adrienne of fifteen years ago were fun loving people. It would be fair to say that both of them would have disapproved greatly of our plans. Well, fifteen year ago ‘Chris’ was so smart, he’d still be making the calls for today ‘Chris’ and I have obviously left that job up to Adrienne and the girls. 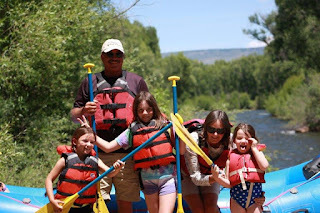 Come to find out, while we have been scrubbing and sorting and mowing and pruning, the girls have been riding four wheelers, fly fishing, watching fireworks in Gunnison and even went on a rafting trip. Both fifteen year ago ‘Chris’ and today ‘Chris’ are terribly jealous and I assume you could plug Adrienne, either version of her, into that camp as well. The point of this one, little ladies? Pretty simple, really. There is a time for almost everything. It’s summer break and you girls need some fun. While you’re gone it gives mommy and me a chance to get some things done around the house. The classes are necessary and so is the mowing. We’ll get it done while you’re gone and hopefully find a touch of time for ourselves as well. As for you? Get your fun in now little ladies. We have math to study and handwriting to work on. If you want to think about running the 5Ks you’ve talked about you need to start running. Soccer starts back up in a couple of weeks and the house always needs help. So, enjoy your fun, and there will be more to be had, but we need a certain amount of focus as well. After you get back you can look forwards to equal parts of work and fun. Spelling here, Renaissance Festival there, Math here, Glenwood Springs there. Balance like that will help you greatly in the future. Speaking of helping greatly in your future, invest in your karma! We are still collecting donations for Mai and her son Nash. For those who haven't been reading this blog, Nash was in a terrible car accident when he was hit by an uninsured drunk driver. His road to recovery is a long one and anything you can do helps. Give what you can, every dollar, prayer and share goes a long way! To donate, click HERE, but if you can't do that, share this post, and if that's too much, say a little prayer for Mai and her family. Thanks again!